When facing an empty formation the offense has 5 potential pass blockers. It doesn’t take great mathematical abilities to realize the defense can simply blitz 6 and get a free rusher. 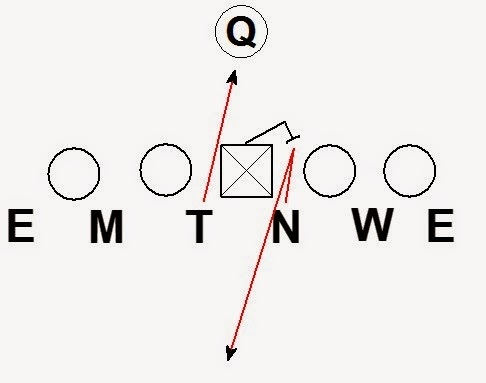 Here is a blitz concept to get the same guaranteed free pass rusher while only rushing 3. The read is simple. Get off the ball and attack your gap. If the OL doesn’t block you keep rushing. If the OL being read attempts to block you drop out. Great get off on the snap. Attack then React. Drop to max depth of 5 yards. You can be slow to go and still get there. If the OL uses a half slide protection. Both OT's block the DEs so both DE's drop out. They are looking to drop into any hot throw by the most inside receiver. The Mike is unblocked and gets a free run to the QB. The Nose is dropping directly over the center. If the offense uses a full slide protection. Here the End is unblocked and gets a free run to the QB. 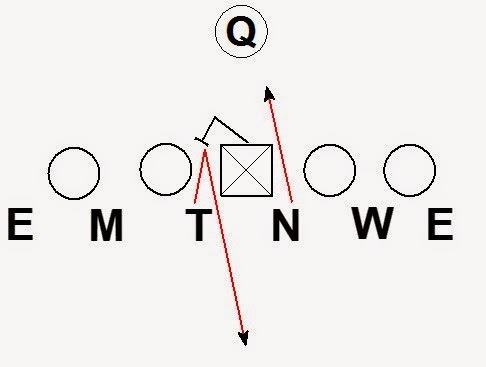 The DE, Tackle, and Will drop out into possible hot throws. The interior droppers allow the DB's to play outside leverage on the receivers. An unblocked rusher guarantees a quick throw from the QB. The interior droppers should take away any inside breaking hot throws. The outside leverage of the DB's should limit any outside breaking hot throws. This "blitz" works great. I have had great success with this when run properly. More often than not it leaves three unblocked rushers headed towards the QB.